The recent Time’s Up and #MeToo movements have cast a giant spotlight on the injustices that have been perpetrated against women everywhere, amplifying the voices of the unheard and silenced. LOVE IS BLONDE intends to focus this spotlight on a particular woman, an American icon, who never got the chance to tell her own truth: Marilyn Monroe/ Norma Jeane Baker. And we want to take this untold story on the biggest stage in the world! We know Broadway is hard to conquer. That’s why we have partnered with two incredible women who, like us, believe in the power of truth, and in helping women and their projects shine. Jennifer Jones and Cynthia Hornig are the mind (and the heart) behind Women You Should Fund, a rewards-based crowdfunding platform by Women You Should Know, a leading digital hub of women’s and girls’ empowerment. Our crowdfunding “TAKING MARILYN’S UNTOLD TRUTH TO BROADWAY” starts OCTOBER 18th, and will run until DECEMBER 20th. Our goal is to raise $ 35,000 to finance an Industry Reading at the Signature Theatre, the first New York City company to receive the Regional Theater Tony Award®, in Spring 2019. That's the first step to reach Broadway and make our star shine brighter and brighter. We have set out 9 pledges/ rewards levels, starting at any amount you can pledge: we know that any contribution will help setting things in motion. Each of the rewards’ names reflects the steps Norma Jeane took to become the majestic Miss Monroe – from an ordinary girl with a dream to a star so bright that her simple name was enough to brighten up the world. After all, Rome wasn't built in a day, was it? 3. click on the chosen level/ pledge, and fill in the form. We will be immeasurably grateful to know YOU have joined us in our dream, and are helping realizing it! We have (quite literally!) designed lovely rewards for your pledges, including the opportunity to receive an Associate Producer credit to our Industry Reading and an exclusive invitation to attend it (BOMBSHELL, THE BLONDE ACTRESS, and MOVIE STAR pledges). Plus, if you choose the MISS MONROE pledge, your Associate Producer credit will apply to both our Industry Reading and our Off-Broadway run when it starts, and thus you will be entitled to earn a percentage (between 2% and 5%) of the weekly revenue of the Off-Broadway run. Some of our rewards are tailored to catapult you into unique experiences, from attending our Industry Reading, to meeting Pulitzer Prize Finalist Joyce Carol Oates at Princeton, NJ, to enjoying a lush weekend at the Carlyle Hotel NYC with a Frank Sinatra style soiree. 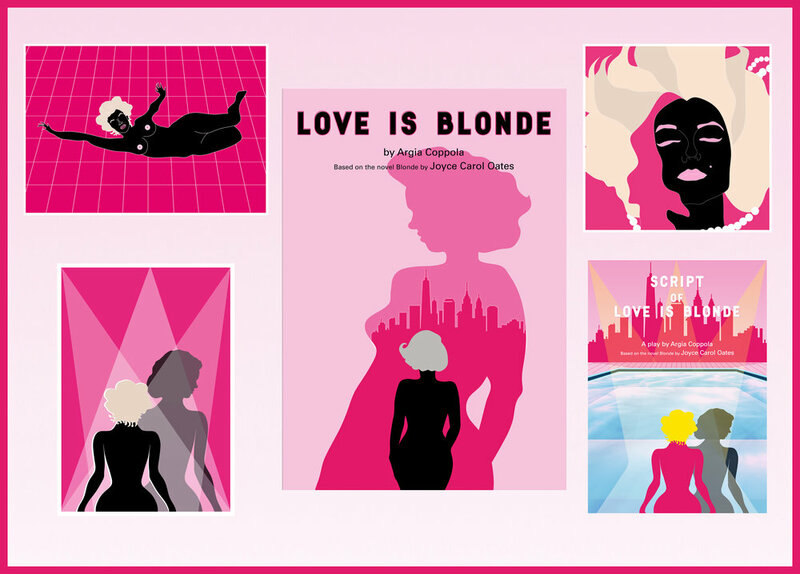 Others will give you a piece of us to treasure at home, such as our official LOVE IS BLONDE playbill, the 3 Marilyn postcards, and the cover for our script. And here’s a closer look at our lovely designs by Raja Khairallah.